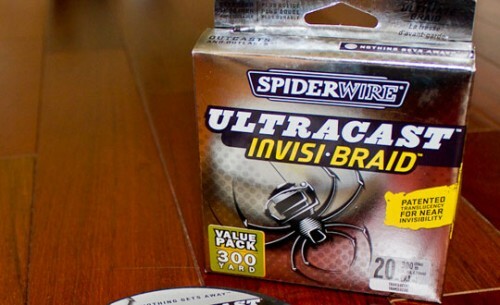 Spiderwire Invisi-Braid Review! | FISHING FURY - A Fishing Blog with Attitude! Chris Jones of Piscatus.net recently posted his review of Spiderwire’s new Ultracast Invisi-Braid line on our forums and I was so impressed with his review that I asked him if I could republish it here in full. Luckily for us, he agreed! When you’re done reading go checkout Piscatus for some mouth dropping photography. Since the dawn of the superline revolution I have used Fins PRT and Tuf-Line XP exclusively, depending on which one was available in my time of need. Both lines are very reasonably priced, have the right mix of memory and suppleness and have fairly low diameter for their test. I have even heard more than once that they effectively come out of the same factory but I can’t find any evidence of this. So it came as a surprise to me when I went against the grain a brought home a spool of Spiderwire Ultracast Invisi-Braid to fill the new Stradic CI4. At almost twice the price of Fins and Tuf-Line this stuff had to be great! Hey, that line is awesome. Definitly going to pick some up. Any idea where it is available in the Toronto area. Very interesting about the loose braid it even looks thicker in the photo. I haven’t experienced that before. You want to very closely inspect your guides for any nicks or burrs. If it consistently breaks within the rod then it is a sure sign it is your guides or line roller. If it breaks outside the rod and there is no visible fraying or abrasion on the line then more likely the line. From time to bad batches of braid find their way out into the world – this could be the issue here? A few years back shops in Australia were replacing line free of charge for anyone that was having trouble with their JigMan braid after a similar issue. I remember a bad run of Fins Superline a few years prior to that as well.